Samsung Electronics and SAP SE, today held the opening ceremony for a joint research center where engineers will conduct R&D for memory solutions to be used in next-generation in-memory computing. The ceremony was held at Samsung Electronics’ Hwaseong campus in South Korea with Dr. Young-Hyun Jun, President of Samsung Electronics’ Memory Business and Adaire Fox-Martin, President, SAP Asia Pacific Japan participating, as well as other executives from both companies. The establishment of the research center is part of an extended partnership between the two world-leading corporations, under which the two will focus on in-memory technology development that enables faster data processing and more insightful analyses of rapidly increasing amounts of data. The two companies intend to lead the push for more advanced global in-memory market offerings by conducting cutting-edge research of next-generation DRAM for customer solutions and working together on their commercialization. 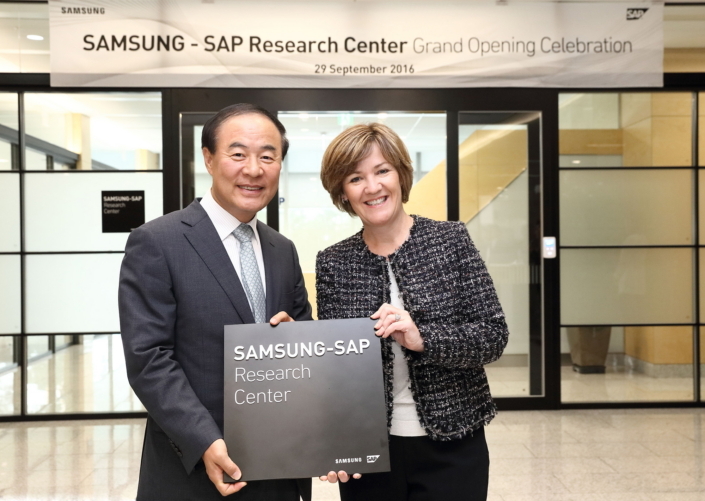 At the research center, Samsung and SAP will provide global customers with optimized in-memory solutions through the provisioning of extensive technical support including test runs of the SAP HANA® platform and evaluation of Samsung’s latest high-performance, high-density memory solutions. The server system at the center uses a 24-terabyte (TB) in-memory platform, which is based on Samsung’s 128-gigabyte (GB) DDR4 3DS (three-dimensional stacked) DRAM modules fabricated on the 20-nanometer process node. The companies plan to apply 10nm-class 256GB 3DS DRAM modules next year to improve overall system performance and power efficiency, which is expected to lead to an in-memory system that will offer even greater return on investment for Samsung and SAP customers. “Together with Samsung Electronics, we will develop the next generation of in-memory solutions for customers using the SAP HANA platform. This collaboration with Samsung extends our partnership and represents our commitment to drive innovation and help our customers win in the digital economy,” said Adaire Fox-Martin, President, SAP Asia Pacific Japan.